Allison Curbishley is now a familiar name on BBC coverage of athletics and as partner to Steve Cram. She remains prominent in the athletics archive in Scotland with her achievements including a 1998 Commonwealth Games medal in the 400m as well as some fast times. 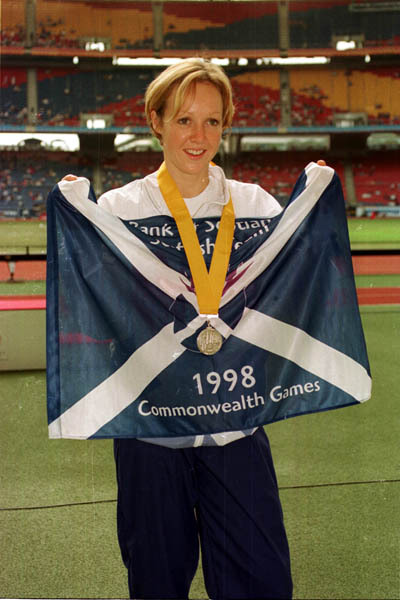 But, through no fault of her own, Curbishley’s podium place in Kuala Lumpur that year also effectively sticks out as a marker for lean years for athletics in Scotland. Allison was the single track and field medallist at that Commonwealth Games in what very much represents the nadir in recent decades. Small wonder, then, that Curbishley was doing cartwheels in the Carrara Stadium in Australia – where she was working for BBC Radio Five Live – when five medals became the best haul since 1990. 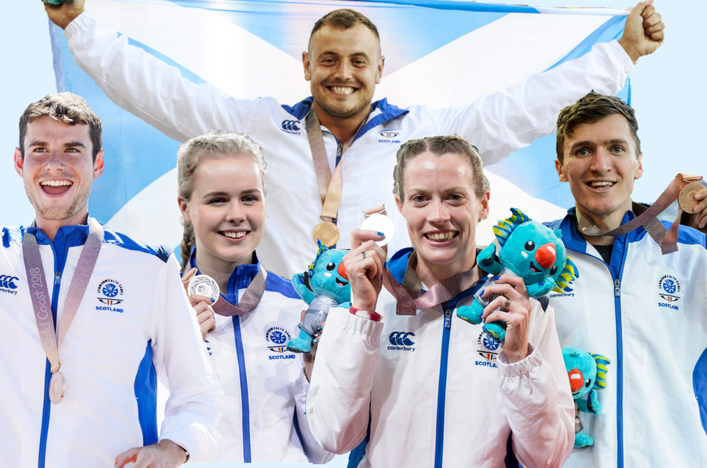 Now she believes Gold Coast 2018 success can breed success, with athletes and the coaches stepping up in years to come and the role models our Team Scotland athletes have become helping inspire the next generation if good development work at clubs is maintained. 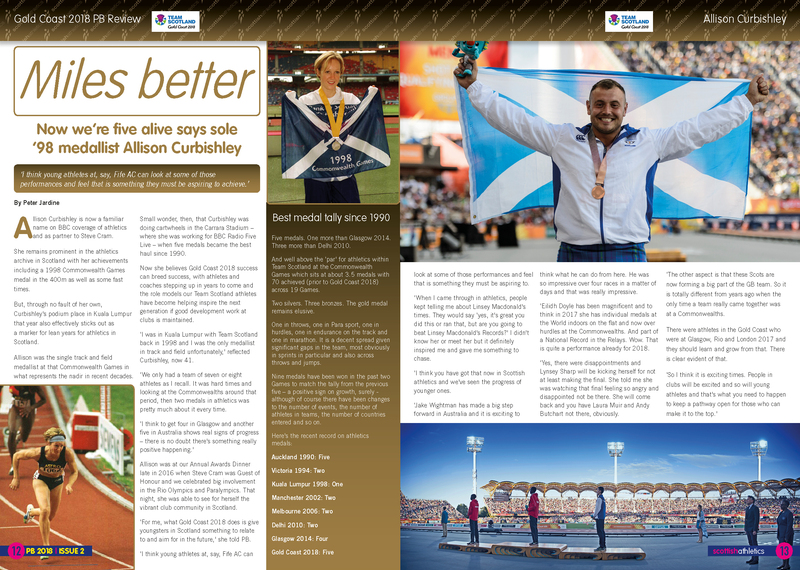 ‘I was in Kuala Lumpur with Team Scotland back in 1998 and I was the only medallist in track and field unfortunately,’ reflected Curbishley, in an interview which appears in the new editions of PB magazine for scottishathletics members. ‘We only had a team of seven or eight athletes as I recall. It was hard times and looking at the Commonwealths around that period, then two medals in athletics was pretty much about it every time. Allison was at our Annual Awards Dinner late in 2016 when Steve Cram was Guest of Honour and we celebrated big involvement in the Rio Olympics and Paralympics. That night, she was able to see for herself the vibrant club community in Scotland. ‘For me, what Gold Coast 2018 does is give youngsters in Scotland something to relate to and aim for in the future,’ she added. 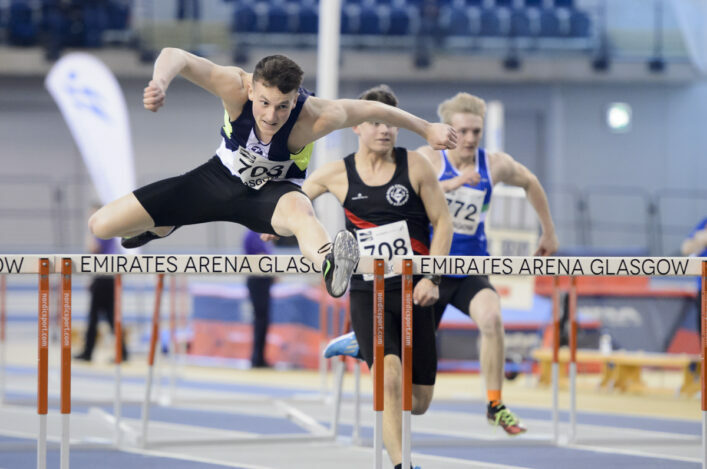 I think young athletes at, say, Fife AC can look at some of those performances and feel that is something they must be aspiring to. ‘When I came through in athletics, people kept telling me about Linsey Macdonald’s times. They would say ‘yes, it’s great you did this or ran that, but are you going to beat Linsey Macdonald’s Records?’ I didn’t know her or meet her but it definitely inspired me and gave me something to chase. ‘I think you have got that now in Scottish athletics and we’ve seen the progress of younger ones. ‘Jake Wightman has made a big step forward in Australia and it is exciting to think what he can do from here. He was so impressive over four races in a matter of days and that was really impressive. ‘Eilidh Doyle has been magnificent and to think in 2017 she has individual medals at the World indoors on the flat and now over hurdles at the Commonwealths. And part of a National Record in the Relays. Wow. That is quite a performance already for 2018. ‘Yes, there were disappointments and Lynsey Sharp will be kicking herself for not at least making the final. She told me she was watching that final feeling so angry and disappointed not be there. She will come back and you have Laura Muir and Andy Butchart not there, obviously. ‘The other aspect is that these Scots are now forming a big part of the GB team. So it is totally different from years ago when the only time a team really came together was at a Commonwealths. There were athletes in the Gold Coast who were at Glasgow, Rio and London 2017 and they should learn and grow from that. There is clear evident of that.